A business associate of Michael’s was in town and wanted to go out to dinner last night so we took him to Jake’s Famous Crawfish. 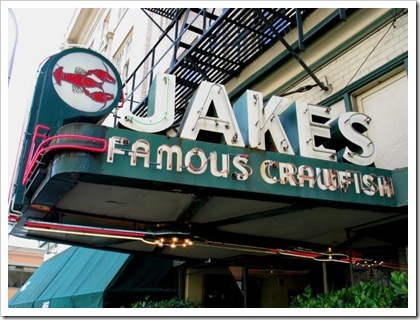 There are two Jake’s in Portland: the one we went to last night, and Jake’s Grill. Both are classy places with excellent seafood. The associate was visiting from Illinois and he said he never gets good seafood out there. That’s a common comment from out of town guests. I suppose I take it for granted since I’ve lived in the Northwest my whole life. I just expect to get great seafood. We split an order of calamari between the three of us. Their calamari is light and not greasy. 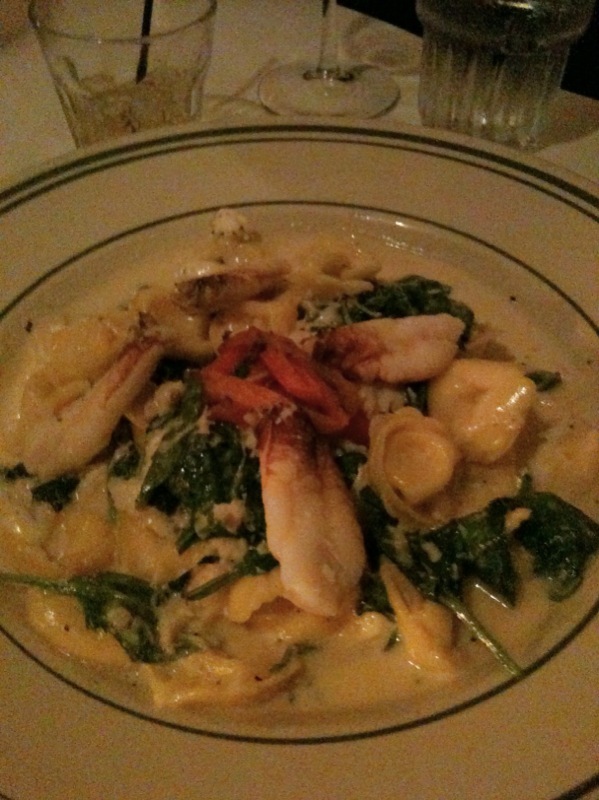 Michael thinks it’s the best calamari in town and I agree (mainly because it hasn’t been dethroned yet!). I wasn’t sure what I wanted to order. There were so many yummy options! I’m forever in search of THE BEST steak in Portland. Nothing has compared to Craftsteak in Vegas. Portland City Grill came pretty close, however. 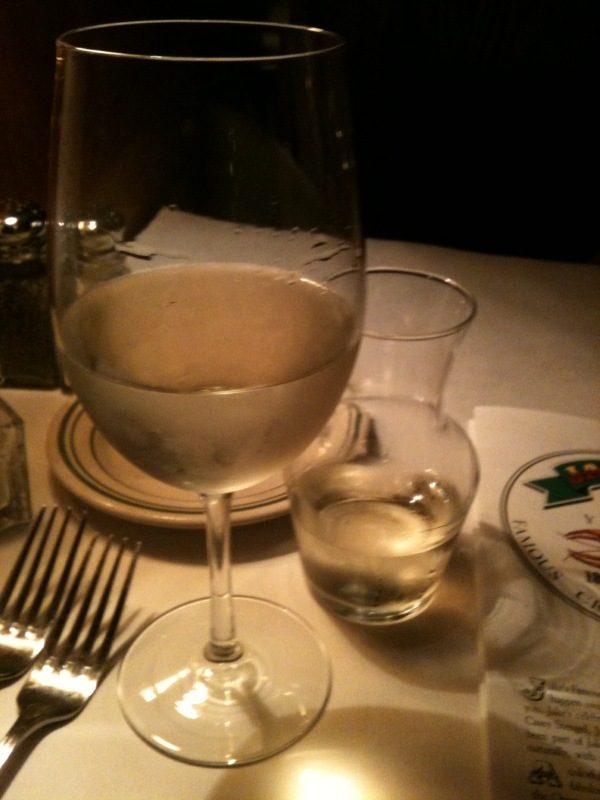 I decided to order a glass of wine first and let that dictate what kind of food I ordered. I ordered my favorite: Chateau Ste. Michelle Riesling. In the end, the Steelhead was calling my name. 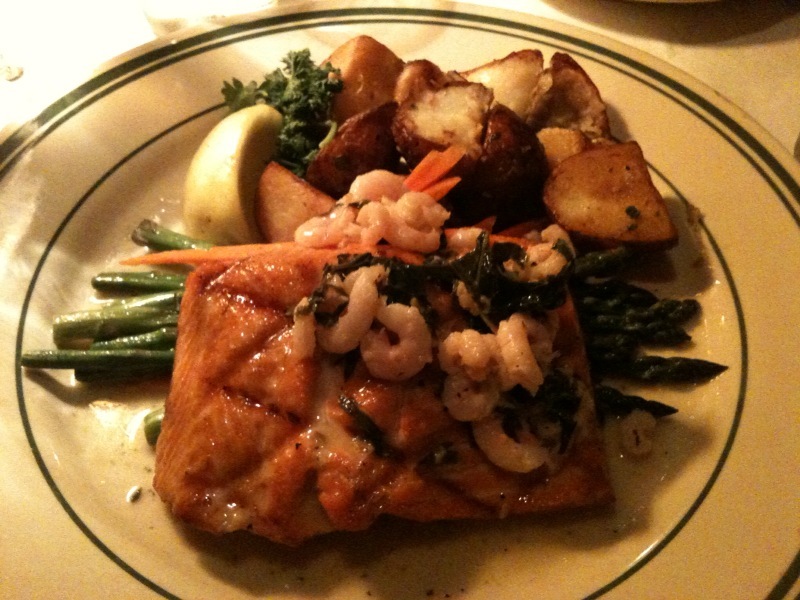 Fresh Steelhead with Wild Oregon Bay shrimp and a basil butter sauce. It was a really light sauce, not creamy at all, and I prefer those kinds of sauces. I asked the waiter if I could substitute the roasted potatoes with a salad and he said no. 🙁 He said they could give me extra veggies instead of potatoes but I said nevermind. The fish was perfectly prepared and melted in my mouth! The sauce was tangy and delicious. I would love to be able to make a glaze for fish like that. 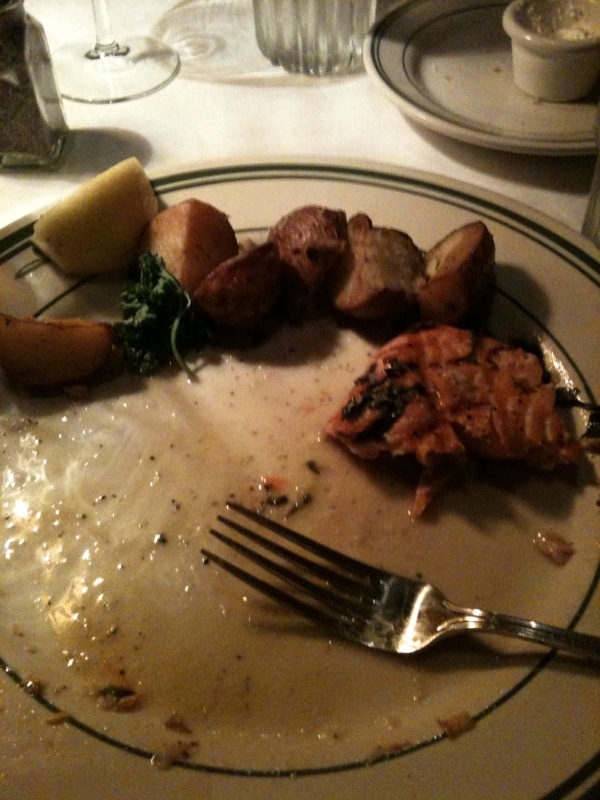 I ate all of the asparagus and carrots, half of the fish, and one potato. I decided to save the rest of it for lunch. Michael ordered the Cheese Ravioli with Crab. It came in a cream sauce with chunks of goat cheese, spinach, and basil. I snagged a few bites and it was great too! I was so full but Michael wanted to order dessert. That was a first (since he rarely wants dessert) so I said yes. We split the Key Lime Pie. It was thick like cheesecake but lighter. I’ve never had Key Lime Pie in my life. I wasn’t sure what to expect. It was tangy and bitter, but in a good way. The little bit of whipped cream was just sweet enough to balance it out and the graham cracker crust was thick and crunchy! It was fantastic. I don’t regret splitting it. QUESTION: Do you have good seafood in your area? I aways thought we had good seafood until I went to Maui for my honeymoon and realized we don’t have crap! haha! We live by the beach, (Southern CA) so we have lots of seafood restaurants. Unfortunately for my husband, since I don’t eat meat, we don’t go anymore. 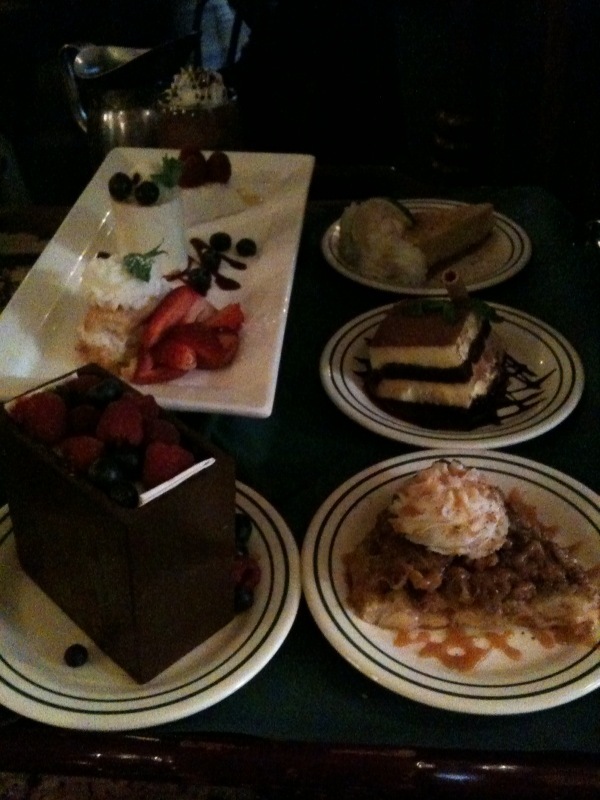 That dessert tray looks so good. I would have not been able to split. I would have had to get my own! No better seafood than Southwest Florida’s fresh Grouper and Gulf Shrimp or perhaps Stone Crabs maybe King Klip or Red Snapper…. hopeful they do get messed up by the BP and Obama not fixing the oil spill! That all looks delicious! I am jealous! 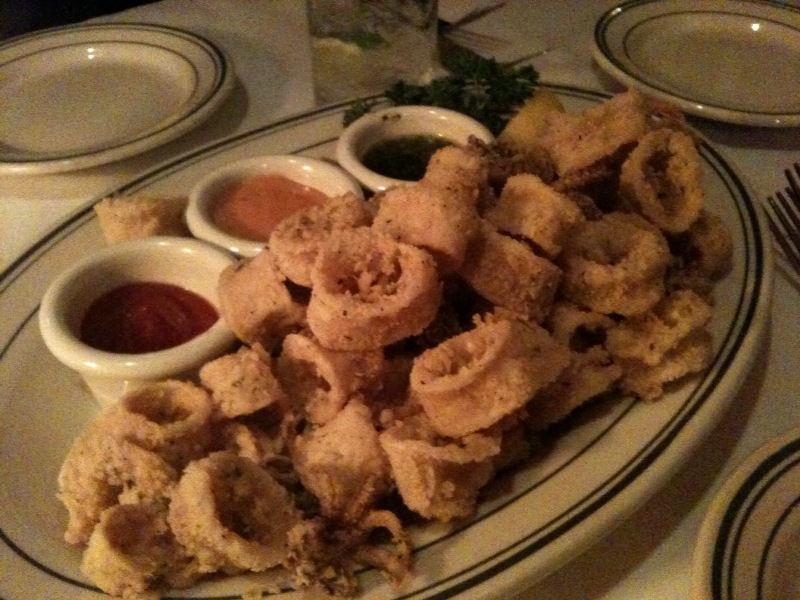 I love fried calamari, but haven’t had it in awhile, just because it is “fried”. I also like the look of that salmon plate. 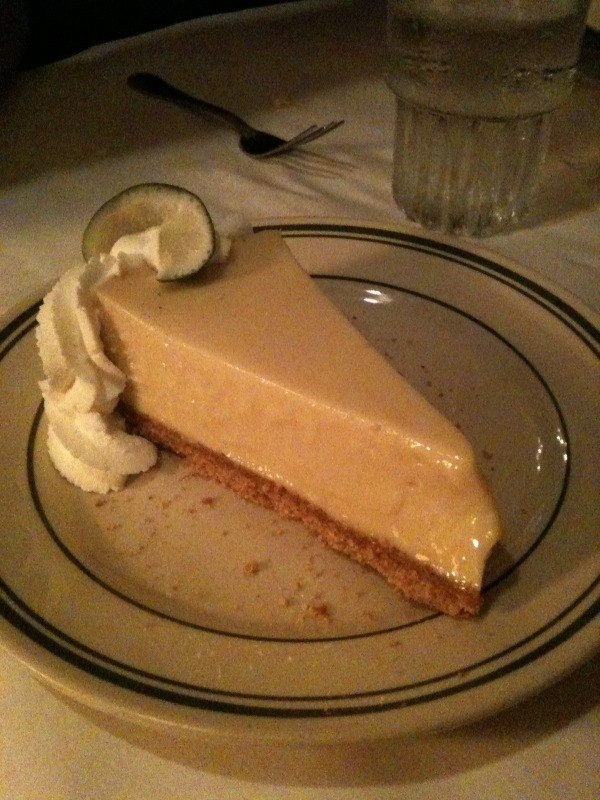 Oh, and the key lime pie……You are killing me! It is kinda “douche-y” that the waiter would not sub a salad for the potatoes. I thought it was weird they didn’t substitute it either. The calamari definitely didn’t FEEL fried! Next time you are in Portland, we’ll have to meet! Definitely…..not sure when that will be, but I’ll let you know! Beyond canned tuna/salmon and various flash frozen seafood – we just don’t have these options. Lots of land food though – great steaks and such. This is living in the Plains! I do enjoy some nice scallops and I love going places with good seafood..mmm. I’m also surprised about the potatoes/salad thing – I mean most places will do it though some charge a little extra. I never understood why salad is deemed a higher priced item. I don’t think I could live without real seafood! Canned doesn’t cut it. The BF’s family visits from Texas and they love the seafood here but rave about the steaks back home. When I lived back East I missed Bay Shrimp soooooo much. You just couldn’t find it anywhere back there. It’s sooooo good on a salad.